PBC on FS1 Returns to Minneapolis Armory Tonight! 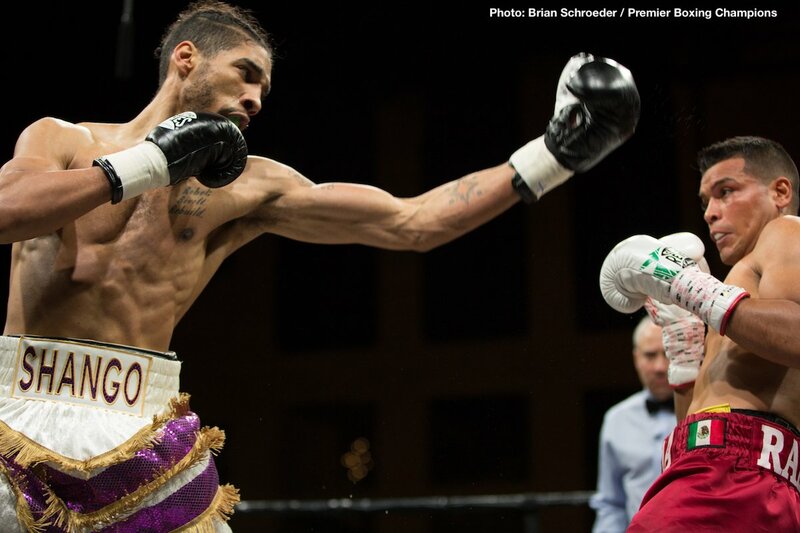 The PBC on FS1 is back in Minneapolis once again with welterweight contender Jamal James and Mahonry Montes in the main event this Friday, August 24th. The overall card is stacked with a number of rising prospects and veteran boxers looking to make a statement on national television. Also, Minnesota’s most popular fighter, former IBF 168-pound champion Caleb Truax takes on Fabiano Pena in a 10-round fight. Since the fall of 2015, the PBC on FS1 has been the most consistent outlet for competitive prospects and middle-level contenders on basic cable. The 3-hour broadcast goes live on FS1 and FOX Deportes at 8 ET/5 PT, along with a recently added, 90-minute prelim show before the main card. The last time the PBC on FS1 visited Minneapolis a severe snowstorm hit the twin cities in April of all months. The promoters of the show expect a healthy crowd on Friday of around 3,000, which is very good considering it coincides with the first weekend of the Minnesota State Fair. Back in April, Jamal James had his hand raised after engaging in a spirited-scrap with Abel Ramos in the headliner. His opponent on Friday is Mahonry Montes, a hard-nosed veteran from Mexico. It will be interesting to see if James fights smart by using his height and outside boxing abilities. Jamal tends to flash his skills in spots but generally ends up getting into a firefight looking to entertain the home crowd. James is climbing up the rankings in the WBA at the 147-pound division. A victory here would surely put Jamal one step closer to a world title opportunity or at the very least warrant another step up in competition. Originally, Willie Monroe Jr. was scheduled to face Immanuwel Aleem unfortunately Aleem wasn’t able to fight, so Javier Francisco Maciel steps in on short notice. Monroe recently signed on with Al Haymon and if all goes as planned, Willie will be looking for bigger and better opponents on the horizon. On paper the 2nd TV fight between Jamontay Clark and Jeison Rosario could be just what the doctor ordered for us fight fans. Rosario is confident, coming off a key victory over Justin De Loach. In his last two outings Clark beat then undefeated Ivan Golub and once beaten Domonique Dolton. Clark looks the part as yet another talented fighter at junior middleweight sporting an impressive 80-inch reach. Something to keep in mind which could play a factor is ring rust. Jamontay has been sidelined since November 17 of last year. The opening bout for the 3-hour broadcasting is a good one, matching former Olympic qualifier Eimantas Standionis against Levan ‘The Wolf’ Ghvamichava in an 8-rounder. Levan represents a perfect measuring stick to see how far along Standionis has come. ‘The Wolf’ has kept a steady pace of fighting tough opposition in his last five bouts and should be able to test Eimantas. Rounding out the 5-fight main telecast is heavyweight prospect Efe Ajagba versus Curtis Harper. The prelim opening fight features a highly-touted amateur in Omar Juarez against Devon Hustler. Hailing out of Fort Worth, Texas, Juarez will be making both his pro and television debut. 6’6’ 154-pounder Sebastian Fondura returns to the Armory. Fondura meets Antonio Urista, it should be noted Urista’s two losses came against unbeaten fighters. Fondura’s last fight was a barnburner from the opening bell. Minneapolis native VeShawn Owens bull rushed Sebastian right out the gate in effort of closing the gap. After a few minutes of action, Fondura began to clear enough space on the inside to land effectively. Considering his nickname ‘The Towering Inferno’, Sebastian’s punches were very fluid, proving he could scrap in the trenches. Putting on my matchmaking cap for a moment makes me think about a matchup between Fondura and Clark in the future. To the powers that be please bring that fight to the Armory. Sebastian at 6’6’ versus Jamontay with an 80-inch reach, sign me up for that one. As previous mentioned this PBC card is chockfull of undefeated prospects with plenty of high-level amateur pedigree. Gary Antonio Russell 11-0 (9 KO), Money Powell 7-0 (4 KO), Leon Lawson 7-0 (4 KO), Efetobor Apochi 4-0 (4 KO), and Minneapolis’s own Celso Ramirez 7-0 (7 KO) all appearing in separate bouts. Tickets for the live event, which is promoted by Warriors Boxing and TGB Promotions, are available by visiting www.ArmoryMN.com or Ticketmaster.com. The show is presented by Premier Boxing Champions with broadcast partners FS1 and FOXDeportes. Side Note: Fans can live stream the fights on the FOX Sports app, available in English or Spanish through the FS1 or FOX Deportes feeds. The fights are available on desktop at FOXSportsGO.com and through the app store, or connected devices including Apple TV, Android TV, Fire TV, Xbox One and Roku. In addition, all programs are also available on FOX Sports on SiriusXM channel 83 on satellite radios and on the SiriusXM app. You are here: Home / Boxing News / PBC on FS1 Returns to Minneapolis Armory Tonight!